Devonshire Dental Care offers a complete teeth whitening service. Teeth whitening, offered at our practice in Scotland is a very simple yet effective way of swiftly lightening the shade or colour of your teeth. It also does not require any removal of tooth surface. These methods can only lighten the existing shade of teeth, not change the colour entirely. what does a teeth whitening procedure involve? The dentist will apply a special whitening product using a tray that fits over the teeth, much like a gum or mouth guard. The whitening formula is then heated up, thus activating its whitening properties. Sometimes a special light is used instead of heat. The ingredients in the formula that whiten the teeth are usually carbamide peroxide or hydrogen peroxide. The process is then repeated until the desired shade is achieved. how long does a teeth whitening procedure take? With our method, only two or three visits will be required. During the initial visit your dentist will take a mould impression of your teeth in order to make the custom whitening tray. Once the first whitening treatment is finished you will be required to continue treatment at home. This involves applying the whitening formula for periods of up to an hour during the next two to four weeks. Some products can allow for the same results to be achieved within a week. why might my teeth need to be whitened? Everybody will have his or her own feelings and opinions, but our teeth colour, like everything else, varies from person to person. Very few people have a naturally brilliant white smile. Teeth tend to become more yellow with age and can become stained by foodstuffs such as coffee and tea. Excessive build up of tartar will also change the appearance of teeth colour, as it has a darker yellow shade. All of these types of discolouration are common so teeth whitening may be a good option. It may also be necessary for those who have staining inside their teeth or those affected by antibiotic staining. how happy am i likely to be with the results? The original shade of the teeth will have an effect on the final results of tooth whitening treatment. Everyone is different, but the effects usually last from between one and three years. It is important to note that the initial period after treatment can result in tooth sensitivity. Given just a short amount of time afterwards though, this wears off. Home whitening kits that can be purchased freely over the counter have been proven to be much less effective than professional whitening. They only contain small amounts of the peroxide bleaching agents and the results do not last as long. Some products are even abrasive and contain acids so, while they might be cheaper, they can damage your teeth and gums. It is advised that whitening treatment is done professionally by a dentist after thorough assessments and evaluations of your teeth. will teeth whitening not work at any point? Whitening might not work in achieving the desired shade of white that you were looking for. It only works on natural teeth and not on any type of false tooth fittings including dentures, veneers and crowns. These fittings can only be whitened if they are professionally cleaned or in most cases replaced entirely. 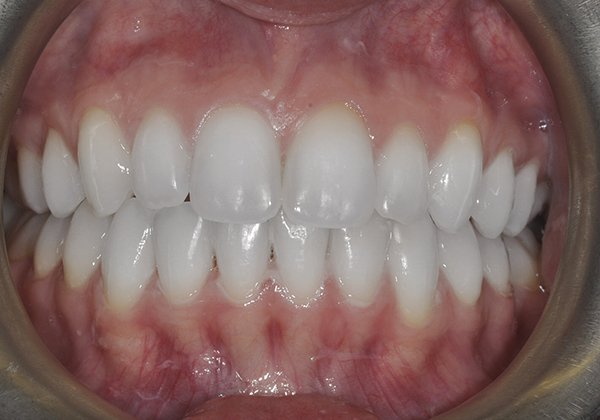 However, if a specific and dramatic change of tooth shade is desired then veneers might be a good option. can i use whitening toothpaste? There are a number of whitening toothpastes available. However, they do not affect the natural colour of the tooth. This is why teeth whitening in Glasgow from our experienced dentist is so highly valued. Instead, they help to remove stains on the tooth surface. Once teeth have been whitened professionally, whitening toothpastes might help in maintaining their improved appearance. 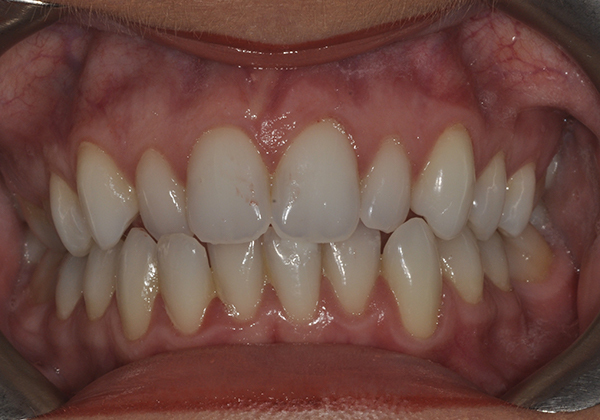 This patient had treatment of gum disease by our hygienist. She then had 6 Month Smiles followed by tooth whitening.